Has anyone any suggestions why this may be happening? Apparently the node-red admins have not changed anything recently. This no longer displays “new posts”, it displays notification count. You will only see “new post” count for anonymous, not logged in users who can’t have a notification count. OK, for me this is a significant negative enhancement. I often have four or five tabs open on threads I am involved with and it was great that I could immediately see when a new post arrived on each thread. I am subscribed to all categories so new notifications come in all the time and I don’t want to go and look at those until a convenient time. However, if others find it helpful then I will just have to manage. Do others think it is a useful enhancement? If you really need it, open the tab in anonymous mode – this will capture the old behavior, as anon users don’t have a notification count. Ahhhhhh … I wondered what was going on! I noticed this also but thought Firefox was misbehaving. I think, though not certain, that I would have to open a separate window for anonymous mode rather than just the tabs, but also I can’t then reply without logging on and then it shows the total notifications again. @cjk77 do you also think this is a backwards step? Like you, I was used to monitoring the number in the tab to watch for new posts without having to click into the tab to look at the forum itself. I’ll miss the old behavior, but I don’t think it’ll be difficult to get used to the change. A theme component could make this functionality user tweakable. @david this is another example where it would be nice to have the ability to store user settings per theme on the server. One of my members on https://se23.life reported that no count is showing at all in the tab title (apparently this was once working). I’m not seeing any count showing, despite having unread PMs and new posts in watched topics. 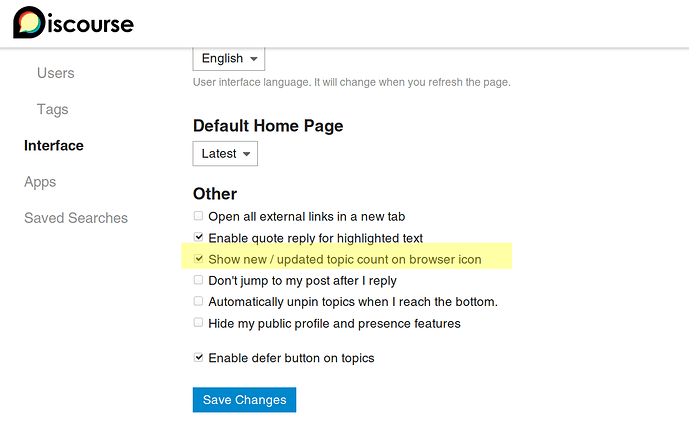 I have tried checking and unchecking “Show new / updated topic count on browser icon” on my user profile. Still no update count. Is there a setting I need to tweak? As previously stated in this topic, only notification count will show for logged in users (in the browser tab). If you need to see reply counts then open an incognito tab as an anonymous user. I found that changing the window/tab title to show “you got a like” a bit too much. I don’t want to have to explain the number mismatch, but one thing I do want to confirm @david are green notifications also included in the number ? @david are green notifications also included in the number ? Yes they are, it adds green + blue notifications. I borrowed the same logic from @Falco’s PWA badge. We can do, I’ll make some small tweaks to core so that the maths is easy to override, then make a component. @ChrisBeach does this line up with what you’re seeing? Thanks very much @david. I’ll test this out soon and let you know. I have to agree with @colinl and @cjk77, this is a significant negative enhancement for me. I agree on an active site with a tab open to the topic list seeing the “new posts” isn’t useful, but with a specific topic open I want to know if something has changed within the topic, not an unrelated notification. For me, in many cases these topics are PMs, so loading as anon doesn’t work. A theme component would be fine with me, but as this stands seeing notification count displayed across 7 background tabs is useless and redundant. @codinghorror this text is already wrong. Add a drop down for [Display unread notification count in title | Display new / update topic count in title] combo. So we would be nuking 2 settings and adding 1 new one.